An elegant bag for evening wear or when you're just needing to feel a little more feminine or sassy. 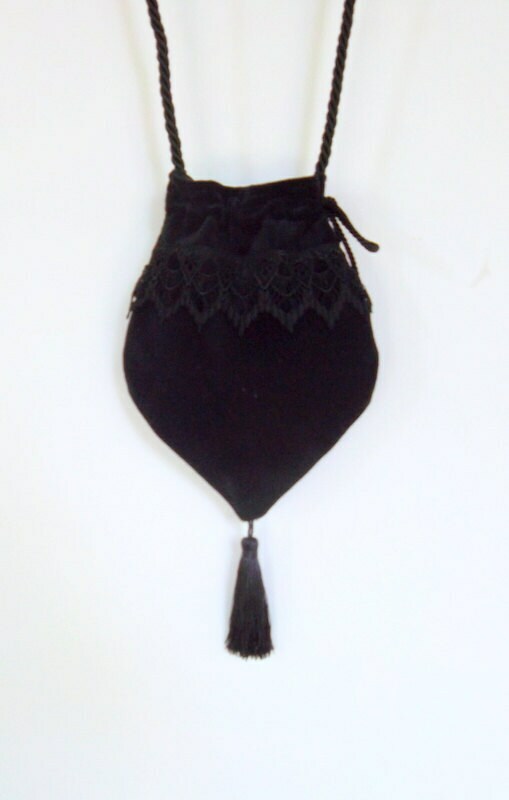 This little bag is made of black velvet and lined with a black satin. It is trimmed in black venise lace. It has a draw string for closure. I could do custom and line with your favorite color or to match your outfit. The cord is approx. 53" long. The body of the bag is 10" with the tassel adding another 4". Love this little bag, perfect for a phone, wallet, and handkerchief. Looks great with everything. Highly recommend! What a beautiful evening bag. Just delivered. I'm very happy with it. Thank you! I will give a full refund if you are unhappy with your purchase if it is not custom. Please let me know within the week of receiving it. As soon as I have received it I will issue a refund minus the shipping cost. I ship lst class usps which takes about 3-7 business days in the states.. If you need it sooner you can upgrade with the priority listing. For international orders I will ship USPS. It takes usually 10-20 business days. Although it can take longer because of customs.